Keep up the great work, Brenda! 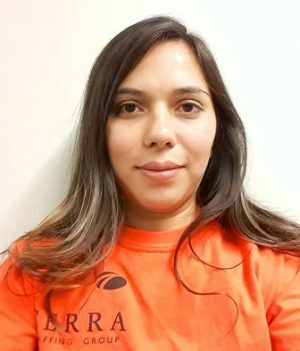 For the last few years, Brenda Gonzalez has primarily done part-time and seasonal warehouse work. When her latest job assignment ended, she was hoping to find a job that offered full-time hours. A friend of hers suggested that she reach out to TERRA Staffing Group, a top temp agency in Phoenix, for help with her job search. Brenda met with Recruiting Coordinator, Jeniffer Toledo, and discussed her needs and wants. While most of her experience was in the warehouse industry, Brenda had done some office work back in college and was interested in expanding her clerical skill set. Her experience and her professional manner made the Phoenix team think that Brenda would be great fit for a short-term receptionist role they had available with a large third-party logistics company. Not long after being brought on as receptionist, however, the client needed more warehouse support. Since Brenda had previous warehouse experience, they asked if she could help out there. She didn’t hesitate and jumped in to help wherever she was needed. Despite not being the job she was initially hired for, Brenda enjoys the work she is currently doing. The client is glad to have her on their team. We asked Brenda to tell us a little about her experience working with TERRA. Her advice to job seekers who are considering working with a staffing firm? Brenda has done a great job of showing her employer all she has to offer and is sure to have a very successful career with them. We wish you all the best, Brenda! If you are looking for a new job opportunity, let us help.